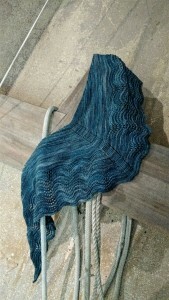 Months after I finished Multnomah, I finally wore it for the first time today. Last month, I finally shooed her off the shawl, washed and re-blocked it…that was when I had found two snags/broken thread in the bound off edge. It took me until this weekend to find the leftover yarn, un-pick back to the last broken thread, and re-knit the edge.